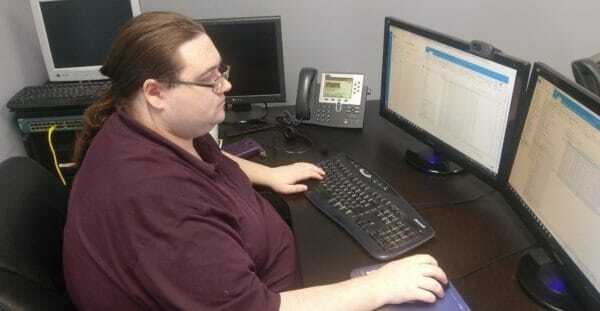 JM’s newest team member is Carl Jacob, Tech Support Specialist. 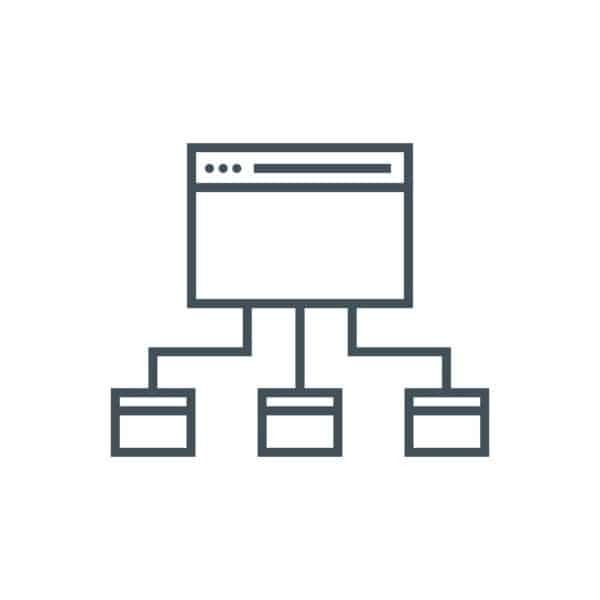 From over-the-phone troubleshooting to back-end server builds, Carl keep JM’s internal team and JM’s clients’ websites and email running smoothly. As a Tech Support Specialist, Carl works within a growing department at JM where consistent growth and continuing education on technologies and strategies is necessary to provide the best service possible. Carl loves the challenges and growth available in the department, and works closely with JM’s Server Admin to best servre JM’s customers. Carl was born and raised in Omaha. Outside of work, Carl enjoys reading, video gaming and PC hardware/upgrading (clearly a great hobby for a tech support specialist). JM’s team works together for the WHOLE online presence of our clients. 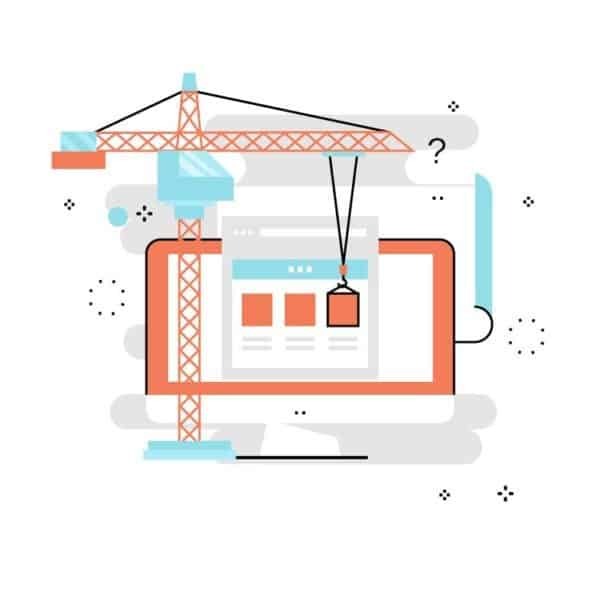 And while our web design, web development, web marketing and web hosting teams are on the forefront, JM has many behind the scenes faces that help run the day-to-day and internal operations. We are taking time to highlight each team member at JM; and next up is Lindsey, JM’s Finance Director. 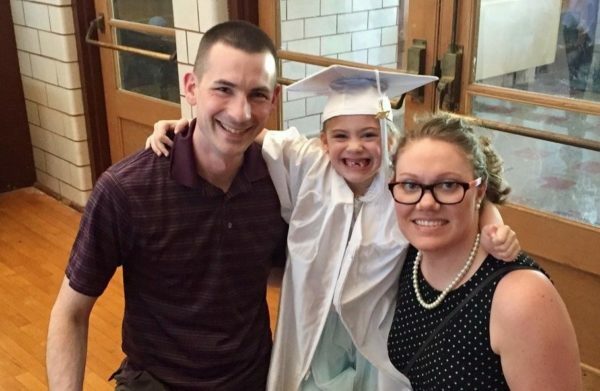 JM has always been committed to families. I am part-time most of the time, and my family loves that I love my job and can flex around needs with my hours and working from home. If Mommy is happy, everybody is happy! JM has offered me continual personal and career growth with educational opportunities, challenges, projects, transitions and goals. We build each other up, and we hold each other accountable! Honestly, the transition from working only from home last year to working at the office two days per week on team days was a challenge because I wasn’t used to the simultaneous conversations, both in-person and on the phone, going on around me. Now I am very skilled at being in the zone at my desk in my corner and popping my head up for the frequent office fun that comes up. In the next few years, I would love to add a minor or another major to my college goals in order to be able to serve JM in a higher capacity. This is a difficult question to answer. (I hope my boss isn’t reading this…) My favorite part of JM is my boss, his wife (who used to do my job and still works for JM), and our awesome dream team of employees I get to work with every day. It’s easy to be completely dedicated in working with our positive team members under Boss’s leadership. Well, here’s the thing: I don’t really read the newspaper or blogs—I actually don’t even watch the news. However, I do look up a lot of recipes on WellnessMama.com. For actual reading, I read mystery/thriller novels. Confession: I’m currently making my way through my grandmother’s Reader’s Digest Condensed Novels volumes my parents gave me last year. My husbands and my girls. However, if they couldn’t come, I would bring a tent, a water filtration system, and some seeds for hardy, edible foods. If one of those items was not available, I would substitute a book or my cross-stitching to keep me sane. When you don’t have to look for it, then you know it’s truly there. I wish I could learn ballet as an untrained adult. My bed. I know, it’s not healthy sleep hygiene, but I just sometimes want to read and snack in the most comfortable place in the house. I am happiest when my house/office is clean and organized (A.K.A.- when my OCD tendencies are appeased). Google My Business offers businesses an incredible opportunity to be found in local search engine results. As Google’s algorithms undergo constant change to provide a better user experience, Google My Business becomes increasingly important for ALL businesses as they seek to have an online presence and seek to be found easily in a local search. Google My Business lists your business location on Google Maps and local search results. The listing is free and is a necessity for both store fronts and eCommerce businesses, and lists important information about your business, hours, location, services, contact information and website link. This is a simple and effective way to be found in local searches on Google. 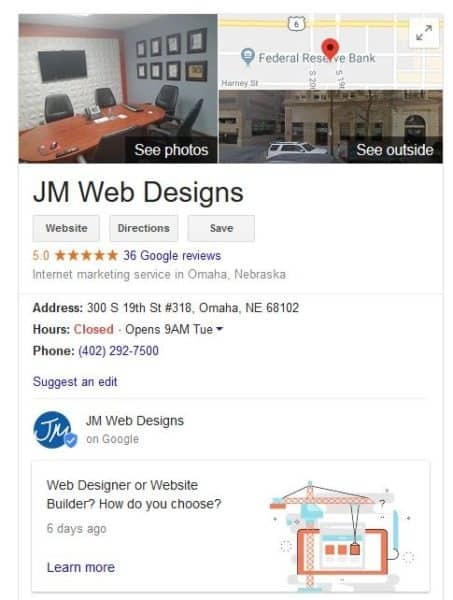 As Google accounts more and more for a user’s location in its algorithm, this local listing will help your business appear when users type in “[keyword] near me.” So, for JM, our listing will appear for a user in Omaha searching for “web designer near me,” because of our Google My Business listing. You’ll notice also in a query like this, Google returns three locations based on your current location. Sometimes, these circumstances require a direct phone call to a Google support tech. Reviews can be powerful. And whether a Google review is positive or negative, responding to these reviews show you value your customers. Positive reviews will increase your visibility, so encourage customers to leave reviews. Listing services with brief descriptions (maybe even pricing) can help Google return your business to a viable customer and can give users a general idea of your business. Photos can help you tell a story by showing your office space, employees and products, your giving users a look into your company culture. It’s a digital storefront. Google My Business has a posts option for each page. For each post you can upload an image, write up a little text, add a title and include a link. This area offers flexibility in promoting events, sales, new products, new services, highlight old services, blogs, etc. These posts expire after about 7 days. 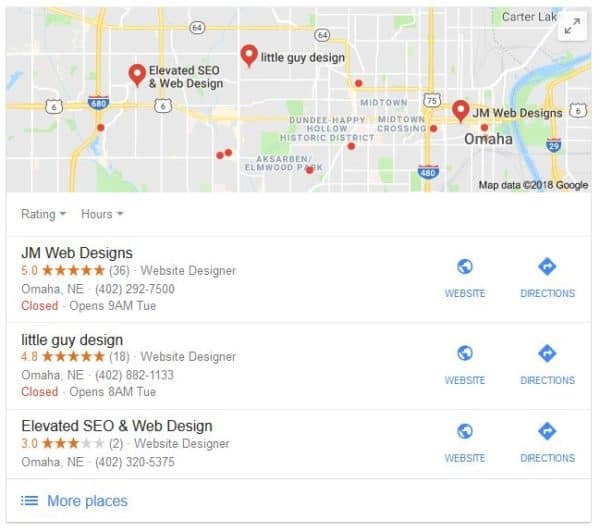 Google My Business is one of the most simple and critical steps you can take to help your website be found in a local search. And it’s free! And if you don’t have the time to worry about this, we’re happy to help you in set up your My Business Page, optimize it and advise you on how to take advantage of all its benefits.